And so to Las Vegas - or Vegas ('no-one calls it Las Vegas Rob' (Charlie)). Rooting around on-line I'd found a fairly good deal for a couple of nights at the Hard Rock Hotel. It is off the strip, but given we were only to have one full day in Vegas, I figured that this wouldn't be a problem, and it wasn't. Thanks to the amazing Sat Nav (I don't know how anyone ever managed to drive into unfamiliar cities without getting lost before) we battled through the mental mess of freeways leading into the city, found the hotel, parked up, registered, and settled into our lovely room: 2 queen size beds, huge bathroom, huge tv, good view, all for (much) less money than the hostel in SF or hotel in a sketchy part of Venice. That evening we spent in the Hard Rock Hotel and Casino, wandering around gawping at the blackjack, craps and roulette tables, trying to work out how to play the slot machines, being underwhelmed by various tatty outfits in glass cases (Kurt Cobain's shirt, the drummer from Blink 192's jeans, Christina Aguilera's thong) and feeding dollar bills into the electronic poker and blackjack games at the bars in return for free drinks. As the overwhelming lights of the city came on, we found ourselves in Bond bar in the Cosmopolitan. Seating ourselves at the bar, we attacked the video machines, feeding in $5 bills, high-rollers that we are. Free apply martinis kept coming, and then it happened - George hit the jackpot. She won $4 on Jacks or Better poker. To celebrate this immense win (she thinks she came out $1 up) we headed back to New York New York and found the Coyote Ugly bar. Inside girls in tightly fitted jeans and the briefest of tops shouted at the patrons through a microphone, occasionally stopping to abuse a male drinker or pour spirit down the throat of a female. The crowd was a grotesque smorgasbord of Vegas caricatures - the fat, the hideous, us. At one point one of the hostesses brayed, asking who had come from furthest away. A couple shouted "UK". I looked around and noticed appalled that they were the very couple that I had considered the worst, fattest and ugliest of the lot. A few vodka and tonics later, and various women had been encouraged to dance on the stage with the hostesses. We meanwhile had started chatting to a couple of fun women from Minnesota. Suddenly they had disappeared on the stage too, and dragged (with my help) George up with them. They kept calling her "Kate Middleton". And so the evening progressed. Later, and I only remember snatches of this, we didn't get into a club because I wasn't wearing a collar (Vegas is a lot like Croydon in this respect). Drunkenly bickering with George, I clambered upset into a cab, and we went back to the hotel where George passed out. It was lucky we didn't go to the club. Again I found myself driving out of a city with a nasty hangover, while George, suffering even worse, swore off drink for days. The first thing to note about Yosemite, and this is not sniping, just, as usual, an impartial reporting of the facts, is that George, however much she tried, could not say it. Andrea will testify to this. It was like Pinot Grigio all over again. Luckily, by the time we were on the road towards Midpines, the village outside the National Park in which we'd chosen to stay, she had developed a method of learning how to pronounce it: "It's just like 'semi'". The drive from San Francisco to Midpines took us through beautiful Californian valleys, filled with orange groves, then up into the hills, through forests of oaks and conifers, and alarmingly, a flash snow storm. We'd started the day in sunny San Francisco. We got out of the car at the Yosemite Bug lodging in gloomy dampness. Rain hung in the air as we hauled the rucksacks towards our cabin. From the outside the prefab portacabin looked unpromising, like one of those awful huts that served as classrooms at my primary school. But on turning the key we found inside a cosy, large and brightly decorated hotel room, all done out in an incongruous '60s theme - crazy pictures and cushions with bead curtains on the window from which hung amorphous plastic shapes. All that was missing was a lava lamp. We drove into the park the next day. To be trite, it is beautiful. 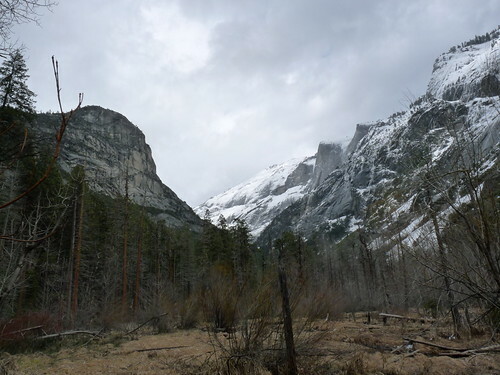 The sheer rock faces rise out of the forests to polished (and often snow-covered) domes, from which waterfalls crash, while down at ground level, one can wander through miles of gentle woodland, looking for elusive cougars. Unfortunately, one cannot necessarily do this alone. As it is the beginning of spring, and we visited on a weekend, the park was bustling with visitors. We drove slowly along the road towards Yosemite village looking for a likely spot to park and head off on a trail. Spotting a sign to a waterfall we pulled in and started up the deserted path. We were just congratulating ourselves on our find, when we turned a corner and realised where everyone was. Leading up to the fall was a steep and narrow path. It was completely iced over, the trees surrounding it blanketed in snow. Thirty or so people were heading both up and down the path - except they weren't. They were scrabbling and sliding and falling and slipping, and whooping and screaming, and mostly getting nowhere. At one point an elderly man stopped and said with delight, "What an adventure!". Of course we joined in, got to the top, admired the scenery and slid all the way back to the car. Further along we parked up again and set off on a 7 mile walk through the woods, where we encountered a fewer people. Unfortunately, over the course of the hike we had to dash across streams from waterfalls and huge puddles from snow-melt. George was fine in her hardy fake all-stars (6 pounds in Buenos Aires), whereas the water started gushing into my ratty old trainers immediately, and during the drive back to our '60s boudouir, my socks and shoes sat under the air-conditioning vents. As I'm sure you can appreciate, it smelt wonderful. The following day brought our first epic drive. Yosemite to Las Vegas, via Death Valley. We started very early, and were rewarded with the sight of deer munching by the curb as we headed south. Not far into the journey, the dashboard lit up "Change Engine Oil Soon". We obediently pulled into a garage, bought the correct oil, topped up the car, and got back on the highway. The message disappeared. As we headed down past Bakersfield, turning towards the east, the landscape started to change, gentle hills gave way to big chunks of red rocks, trees to scrubland. We headed up over mountains and were rewarded with epic views of the Death Valley wilderness below, the distant road cutting through the centre of the white parched ground. Dropping down onto the desert floor, we pulled to the side of the road, took some snaps, wondered at the silence, and then headed on through similar landscape, past glittering weird rocks and sudden sand dunes. As we were driving through Stovepipe Village, the oil message flashed up again on the dashboard, despite the car being full of the stuff. This was not the best place in the States for the car to start developing mechanical problems. We pressed on, hoping not to get stranded in the wilderness. 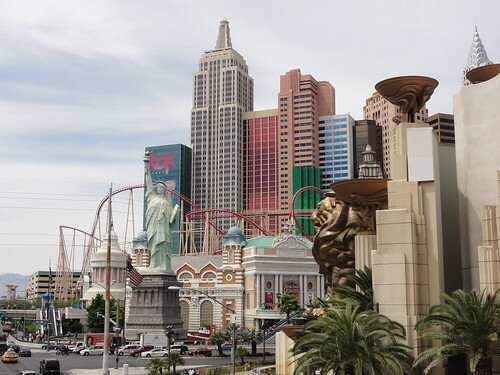 Thankfully, a few hours later, Las Vegas rose out of the desert, like a big pus filled pimple on a dry and craggy face. Because of our Big Sur diversion, night was falling as we dropped off the freeway into San Francisco, city of hippies and hobos. There seemed to be considerably more of the latter around in the 3 days we stayed, perhaps they all used to be the former. As usual we did plenty of walking. On our first full day, George was pulled by her extra-sensory shopping powers to the vintage stores of Haight-Ashbury. Having travelled up and down the length of that colourful neighbourhood, and gulped down yet another Vanilla milkshake for sustinence, I sought out the Cartoon Museum in the area south of Market Street - "SoMa", naturally. George left me to my own devices, presumably to visit more shops. The following day, we once again trekked over the city's hills, through Chinatown and Little Italy, to tourist friendly Fisherman's Wharf, where, after gawping at the diminishing population of sealions at Pier 39 (some say they are leaving because a big quake is imminent) we hired bicycles and pedalled off towards the Golden Gate Bridge. I am happy to report that in the 7 or so miles we covered, over the Bridge and back again, George managed not to fall off. She did however give voice to her suspicions that she had been given a "special" bike as it seemed extra hard to pedal. We located a small bar near the hostel - dark and showing sports on the box, as we drank on the bar stools and nonchalantly flung down dollar bills as tips, we smugly felt we were living the true barfly experience. George even accused me of ogling the barmaid. I wasn't (although she was very pretty). Any jealousy issues didn't stop George recommending that we visit the bar again the following night, with Andrea and Mitch, who we met for a slap up Japanese meal. 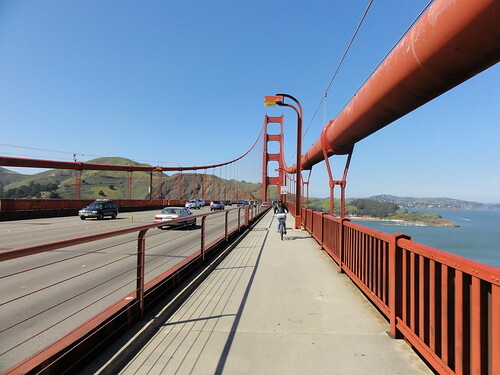 As a result, the following morning, a gnawing hangover attempted to distract me from steering the car over the Bay Bridge and out of the city towards Yosemite. Having tracked us down to our Venice Beach digs, The Cadillac Hotel, Alisha chirpily told us that it was in an area frequented by crackheads and was infamous for its prostitution and bed-bug problem (the two may not be unrelated). Luckily, the place appears to have been renovated since it picked up that unsavoury reputation, and was pleasant enough. The part of the Venice Beach boardwalk the hotel sits on is a bit grotty though, with hobos emerging from their sleeping bags under palm trees each morning. The boardwalk in general is a bit like a sunny and tanned Camden market, except with more medicinal marijuana clinics, and one stroll along it on our first morning was enough for me. Luckily Charlie and Alisha were there to rescue us from the beach, and we had our first home cooked meal for months at their place in Marina Del Rey. 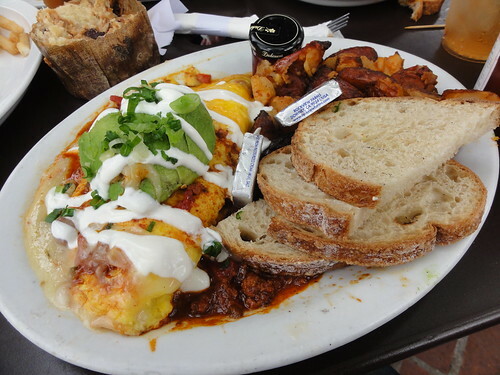 We were also taken to some great restaurants, including one for lunch in Los Feliz, where I ate a "Hearty Texas Omelette" that stayed with me for some time to follow, took a good few years off my life whilst giving inches to my waistline. But, with its double cheese, avocado, chili and cream, it had to be ordered. One morning I drove The Beast around to Charlie and Alisha's and then had to follow Alisha in her Lexus as we headed for the Hollywood sign. I cautiously maneuvered The Beast onto the freeway, which was screaming with traffic, as Alisha phoned Charlie (who was sitting next to me) and told him to tell me to stop driving like a pensioner. But the freeway was a piece of cake compared to the narrow winding streets leading up to the Hollywood Hills. By the time we had reached the sign I decided that The Beast was just too wide to properly enjoy driving. I didn't want to be forever worrying about knocking off wing mirrors. 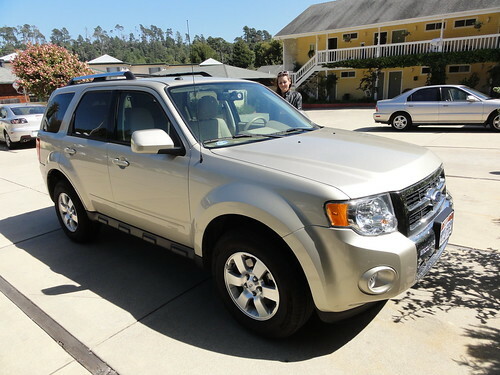 So Charlie and I headed back to LAX and I traded The Beast in for a Gold Ford Escape with a tan leather interior. Other highlights of LA included watching dolphins playing around off Manhattan Beach, and a Clippers v Oklahoma City Thunder basketball game (National Anthem, Cheeleaders, Beer, Hotdog), which I was lucky enough to go to with Charlie, while George got drunk with Alisha in Venice. And then, very quickly it was time to board our new gold car and head out of town. A final breakfast helping Milla eat her pancake shaped like a bear's head (banana nose, grape eyes, orange slice mouth), and then out onto the Pacific Coast Highway, with no real idea of where we were going to spend the night. We landed that afternoon in a town called Cambria, full of antique shops, and stayed in a very pretty independent motel on the edge of town. It was here when it struck us: we were suddenly on our own, on the road, struggling with American petrol stations (effectively you can't start pumping until the attendant is satisfied you're not going to scarper without paying) and how much to tip in restaurants (in LA C&A had guided us through this minefield). Cambria is at the south end of the Big Sur stretch of coastal highway. Before setting off the morning after we left LA, we grabbed coffee in town. Unfortunately, the barista hadn't put the lid on mine properly, and as I drank I became aware of a growing hot damp sensation in my lap (no tip for her). Meanwhile George, who has been for the last few weeks exclaiming at random moments how she was looking forward to using her new thermos to drink hot coffee from during long car journeys, carefully filled up the thermos for the first time, only to discover an hour down the road that it had gone stone cold. We decided that it probably wasn't a thermos, but a canteen for keeping drinks cold. In the shadow of such inauspicious coffee based omens, we set off up the pretty ocean road. It is a spectacular drive, taking in windy hill passes, an elephant seal colony, inaccessible beaches and blankets of wild flowers. We noted the "Road Closed" signs every 50 miles or so, cheefully preparing for the imminent detour. Unfortunately, 200 miles north of Cambria, for the first time one of the signs also bluntly informed us "No Detour". And 9 miles later, sure enough, there was the end of the road, with no detour in sight. In fact the only way to get to San Franscisco was drive 200 miles all the way back to Cambria and find an alternative route. So, not a flawless start to a road trip, but at least the 400 superfluous miles we drove were through beautiful country. The beginning of what was to be a very long day didn't start promisingly. "I feel sick" announced George. We were sitting on our rucksacks by a Caye Caulker jetty, waiting for the 7am water taxi to Belize City, the first of a variety pack of transport options we were to sample that day. Despite the water taxi bouncing with increasing violence over the Caribbean, when it deposited us at Belize City George's nausea appeared to have diminished, and we jumped in a taxi bound for the airport. My heart sank as the driver told us he was going to take us on a guided tour of the city, and then asked what time our flight was. George lied and said it was an hour earlier than it was, but the tour began anyway. Fortunately this wasn't, as I had suspected, a convoluted way of taking us to his friends' shops and restaurants (like a crooked Avis driver had done in Delhi). Instead he simply pointed out the points of (vague) interest that cropped up on the way (some government buildings, a sports stadium, a boys' school, a girls' school) and it turned out to be a pleasant way of seeing a city that received wisdom states is too much of a dump to bother staying the night in. There's not much to do in Belize City airport, so George and I spent much of the time messing around on our iPhones as we waited for the plane. This is one of our two top ways of killing time. The other has been playing "Shithead", but George has been reluctant to play following my historic winning streak in Caye Caulker. I haven't seen the pack of cards for at least a week. After about 3 hours' wait, we were flown to El Salvador (an hour's journey) where we waited yet again, this time to board the 5 hour flight to Los Angeles. The queue for immigration at LAX seemed to take almost as long as the flight there. But by the time we got to the front of the queue we were virtually waved through (at least after submitting our finger prints), a very different experience to my ordeal at Wayne State Airport in Detroit some years ago, where I was removed to a separate room for questioning. Customs was a breeze, and then it was on to the Hertz shuttle which dropped us a few miles over on the other side of the airport (it is massive, thank God we didn't attempt to walk to the car rental lot as we had briefly discussed). Night had well and truly fallen by the time we tracked down the correct car parking bay and came face to face with The Beast. We booked the rental car on the Hertz website some months ago (a rare example of our forward-planning on this trip). Not being a particularly numerically-orientated person (i.e. my maths is exceptionally poor) I didn't bother looking at the dimensions of the vehicle we were to hire. I'm also not very automobile orientated (i.e. I know absolutely nothing about them) so engine size, cylinders, wheelbase, meant nothing to me, as little as height, width, length. Instead I just looked at the picture on the website and went for what looked like a nice compact SUV. The Chevy Traverse is, in reality, an absolute monster. Behind the front seats there are two further rows of seats, and then a boot. In terms of width, it is akin to a transit van. George flat-out refused to drive. I climbed in. It was lovely and new, with helpful features like rear camera display in the rear-view mirror and that beeping thing that tells you when you are too near an object (invaluable in a tank like this - what a shame it only works for the front and back, not the sides). Despite these features, I was still bloody terrified, but not as terrified as George who, as I thundered out into the the LA night desperately trying to listen to the woman's voice purring out of the SatNav, gasped and shrieked and exclaimed at every turn, stop, start and near-miss. We made it though, down to Venice Beach, and a car park, and a hotel, and, at last, bed.